Here at Chef & Spice we want to give you the best all round dining experience, as we are firm believers that a trip to a restaurant isn’t always just about the food but the service that is delivered. Unlike most restaurants; while you are tucking into our delicious food, we provide second to none entertainment, adding a little something extra to your overall visit, ensuring you have an unforgettable time. Every Friday we have a random magician come to our restaurant to perform amazing, breathtaking tricks at your table. Sleight of hand, illusions and hypnosis is the bigger picture of what you can expect from this superb magician. Magic Amit’s magic isn’t just about capturing your attention, but rather putting on a theatrical experience that taps into your emotions. Amit’s magic tricks and hypnosis skills are the highlight of any social event. The secret for a truly successful and memorable magic performance is to combine flawless magic with a tad of comedy and charisma and Amit delivers capably on all fronts. Everybody loves a good magic show and people of all ages and background will be intrigued and mesmerized when Amit takes over the stage! Bringing some light entertainment to your Friday night meal, you can opt in or out of the show as Magic Amit makes his way around the tables. Click here to see what all the fuss is about! Who is Magic Amit you ask? He thrives off people who revel in mystery and wonderment, and leaves you feeling unnerved with his supernatural knowledge and abilities. He tells stories that are experienced in the mind and soul. 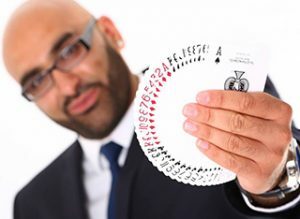 Magic Amit has been performing for the last decade, in places such as Leicester & London. Not only for private events but corporate events as well!